Note: The Indian Armed Forces operate a number of Unmanned aerial vehicles split between the three service branches. IAI Searcher Israel পরিদর্শন ও নজরদারি Mk. I / II 108 Operated by all three services. 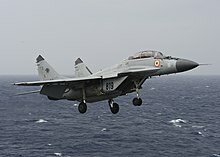 DRDO Lakshya India Aerial target 39 In service with the Indian Air Force and Indian Navy. The Indian end of the telescope: India and its navy, Naval War College Review, Spring, 2002 by Gulab Hiranandani. Guard of Honour for Vice Admiral Wolfgang E Nolting, Chief of German Naval Staff. Kanhoji Angre - Notable Maratha Admiral based on whom INS Angre - the western naval command - is named.